Hello Magooshers. I have a little something special for you today: A video lesson on phrasal verbs. Today we’re focusing on phrasal verbs that are used in the business world. Business English is an especially useful form of English to learn. In can help you on the TOEFL, since it’s not uncommon for TOEFL passages and audio tracks to focus on business. It can also help you in life— more and more employers want you to have good business English skills so you can talk to colleagues from other countries. In the video below, I explain all the ins and outs of using these four phrasal verbs, with in-depth explanations of the grammar rules, and lots of examples. When you’re finished watching the lesson, enjoy the comic strip below the video. 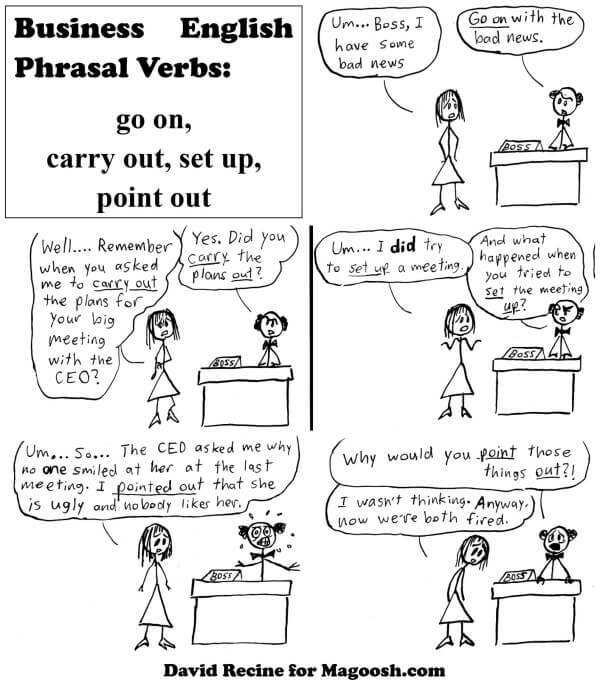 This comic shows all 4 phrasal verbs in use. Be sure to check out my other phrasal verb Magoosh Comic too!